The Hollywood Walk of Fame’s Only Non-Star Tiles Are In Honor Of What Event? The Oldest Continuously Published Newspaper In The United States Is The? The Hollywood Walk of Fame is a stretch a little shy of a mile and half that runs east to west on Hollywood Boulevard in Hollywood, California. The walk contains over 2,400 stars dedicated to people and events within the media industries covering film, television, music, broadcast radio, and theater. The standard star is a pink marble star with brass lettering and logo inlaid in a gray tile. All the tiles are standardized except for a set of four tiles anchoring the corners of Hollywood Boulevard and Vine Street. At the four points of the intersection are four grey marble moons dedicated to the Apollo XI space mission. 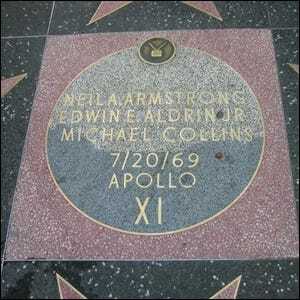 Each tile is inscribed with the names of the Astronauts–Neil A. Armstrong, Edwin E. Aldrin Jr., and Michael Collins–as well as the date of the first moon landing and the mission name. While the impressive feat of landing on the moon is worthy in and of itself for a special honor, the tiles are tagged with a brass television, putting them firmly in the broadcast category–a fitting honor since over 93% of the nation tuned in to watch the historic moon landing.